Immediately following and attendant upon Texas entering the Union, a reshuffling of the Federal Territorial Government began and a change in nomenclature was adopted by the Municipal United States Government. This started in 1845 and culminated in 1851. Prior to that, the Municipal Government functioned using the nomenclature of Roman Civil Law and the conventions of Latin. It's all "signed" as "Texas" without any finer distinction available in English text. This causes confusion for people delving into old documents, but its not really that confusing. In the earlier "Latinized" documents, "texas" is the national soil jurisdiction of the republican state operated by the "people", "Texas" is the land jurisdiction State operating the international jurisdiction of the People. "flavius josephus" is a free man. "Flavius Josephus" is an indentured servant or Office Holder. "FLAVIUS JOSEPHUS" is a slave of Rome. Thus in the old Latinized documents that you run across in your research a reference to "virginia" is talking about the soil jurisdiction of the colony or the republican state, depending on the time frame, while a reference to "Virginia" is talking about the international land or sea jurisdiction of the colony or the republican state, and if --- very rarely --- you run across a reference to "VIRGINIA" in old pre-1851 papers of the Territorial or Municipal Governments, this indicates the global jurisdiction of the air that is subject to Rome, but nonetheless attached to the ownership of the republican state, virginia. There was a resurgence of these "Latinized" conventions in this country following the Second World War, when the Romanized Municipal United States Government exerted itself and issued "PERSONS" in the "name of" American State Citizens who were wrongly registered as Territorial United States Citizens. This is because the Territorial United States [Military] Government was in debt to the Pope and the Holy See. They had earlier in the 1920's - 1940's created Territorial "franchises" for themselves, operating in names identical to our Given Names and appearing to be Proper Names in English, but having been "Registered" as British Foreign Situs Trusts operating in the international jurisdiction of the sea, not recorded as the Given Names of American State Nationals. The British Territorial United States Government having accomplished this fraudulent "unlawful conversion" and identity theft, then sold these fake franchises as "salvaged property" presumed to belong to the former Confederate States of States to the Roman Pontiff. The Roman Pontiff then converted these into WARDS of the Municipal United States Government, and various incorporated entities operating under these slave NAMES were created --- most especially, a Pauper doing business under a NAME styled as "JOHN DOE", a Cestui Que Vie Estate Trust doing business under a NAME styled as "JOHN MICHAEL DOE", and a Public Transmitting Utility doing business under a NAME styled as "JOHN M. DOE". As things stand, the British Territorial Government has been briefly subjected to Chapter 11 Bankruptcy and the Municipal United States corporation claiming to own all these various entities as "WARDS" of the various Municipal STATES OF STATES is undergoing liquidation. At which point, we have stood up and said --- ah, wait a minute --- there's been a mistake. 3. We are here at home, standing on the land and soil jurisdiction of our States, owed every jot of the Constitutions, and also owed the return of our natural birthright estates free and clear of any debt or encumbrance. We are also owed any profit realized from the lease and use and trading upon of our private and public property. Both have taken advantage of and attempted to cheat generations of Americans via the undisclosed and unconscionable contracts provided by phony birth registrations --- used to create the legal presumption that we were all choosing to be counted as "United States Citizens" and that we were, moreover, leftover "rebels" and abandoned assets of the defunct Confederate States of States---- instead of being peaceful American State Nationals native to States of the Union that were never involved in the Civil War, never at sea, and never engaged in international commerce at all. Remember the movie "Lonesome Dove"? Remember how Gus and Woodrow wound up hanging their friend Jake Spoon? Jake was an affable man, not a bad man at all, just weak and shiftless. He fell in with a gang of murdering horse thieves and cattle rustlers on the trail, and by the time he realized what company he was in, it was too late. Though he didn't participate and didn't kill anyone, he was guilty by association. Maybe it hasn't really hit rock bottom yet, but US Citizens can't organize an actual State of the Union and its a crime for them to be involved in any such thing. It's not a small crime, either. It's a whopper. Even if they mean well, even if they don't know that jurisdictional boundaries have been crossed, even if they are innocent as the flowers in May. Bruce Doucette got 38 years under the statutory law --- and it would have been worse if he had been tried as a US Citizen under Common Law. He and the other people with him could have been hung. Just like Jake Spoon and for the same reason. Anyone who hasn't got their identity nailed down and their political status correction on the public record is presumed to be a US Citizen, and it is a crime for a US Citizen to be a member of anything calling itself a State Assembly. So. I am not being mean. I am not being arrogant. And I am not being set up with some phony collusion charge and being railroaded, either. Those other groups are doing what they are doing and The American States Assembly is doing what it is doing--- and never the twain shall meet. Why? Those who don't do the paperwork, who don't reclaim their birthright on the record, who don't rebut the presumption of US Citizenship --- are leaving themselves and their Assemblies open to being charged as criminals, and anyone who aids and abets them or associates with them, is open to guilt by association and claims of conspiracy and collusion. There is one other kind of "guilt by association" I want to discuss and this one is, if possible, even more troublesome. This is the one that confuses me and my team with public servants. Some people think that I and the other members of The Living Law Firm are public employees, that it is our "job" to straighten this mess out and bring the claims and do all the work for everyone. And they blame us, because they are sitting on their rumps expecting to be served and expecting to get everything for free and they think somehow that its not their problem --- it's our problem, as if we caused it by discovering it: again, guilt by association. Here's the rest of the story, and I am not being arrogant, irresponsible, or mean. I am telling you the truth. It is our problem --- it's a problem for every American and every US Citizen. We have all been set up. We've been defrauded, enslaved, lied to, and the plans are well-underway to steal our inheritance right along with our identities. What the British Territorial Government under the Queen and the Municipal United States Government under the Pope did to us, is just a gigantic national level identity theft. It has the same results for everyone. If you are an American, you've suffered identity theft and institutionalized fraud and robbery. If you are a US Citizen, you've been fingered as a criminal and left holding the bag and the national debt. Either way, they did this to us while pretending to be our friends, our Allies, and our protectors. If you want someone to blame, blame yourselves first for being so clueless for so long, then blame the Queen and her lot for all the lies they've told about all of us, and then finally blame the Roman Pontiffs and the Roman Curia for their parts in all this rot ---- but don't blame me and don't blame my team. We are not associated with the crime and we are not guilty by association, either. Just today I was talking with a friend about her concerns about her employer-based credit union and I explained that all banks and credit unions are obligated to "denominate" the digits representing funds in our accounts as "lawful money" if and when we request this. In real terms this means that your digits have to be interpreted as United States Notes instead of Federal Reserve Notes. It may seem like a small thing, but it's not. Every penny that gets redefined as lawful money reduces the US National Debt by the same amount. The same thing happens when we endorse every check or other financial instrument with a "limited endorsement" that says, "Redeemed in lawful money -- 12 USC 411". It makes no difference to you or your creditors or vendors, but it reduces the US National Debt by the full face value of the check or other instrument. If every American Senior did this same thing religiously and converted all their retirement accounts and checking and savings and insurance and mortgage accounts and started "redeeming" them all in lawful money, the US National Debt would plummet like a rock, and the Seniors would enjoy the added security of knowing that their funds were no longer subject to seizure by the banks. Lawful money is a material asset, not a credit. The bank has to carry lawful money as a material liability. It couldn't happen to a nicer bunch of crooked scumbags. 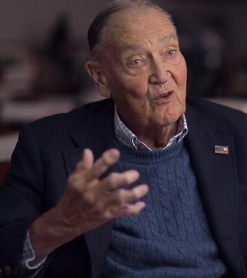 The legendary John Bogle passed away yesterday in Bryn Mawr, Pennsylvania. He was 89.
appeared on the PBS program Frontline. Bogle dropped the bombshell that Wall Street has attempted to hide for half a century: If you work for 50 years and receive the typical long-term return of 7 percent on your 401(k) plan and your fees are 2 percent, almost two-thirds of your account will go to Wall Street. You can check the math yourself. Access a compounding calculator on line. Input an account with a $100,000 balance and compound it at 7 percent for 50 years. That gives you a balance of $3,278,041.36. Now change the calculation to a 5 percent return (reduced by the 2 percent annual fee) for the same $100,000 over the same 50 years. That delivers a return of $1,211,938.32. That’s a difference of $2,066,103.04 – the same 63 percent reduction in value that Smith’s example showed.